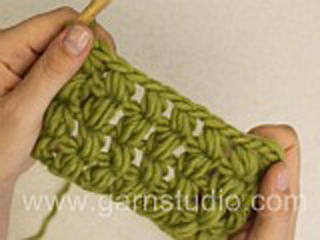 In this DROPS video we show how to crochet puff stitches. 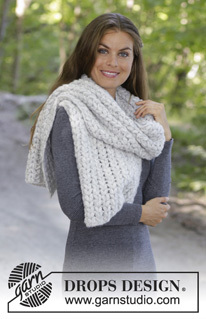 Try this fun crochet texture - it's perfect for scarves ! 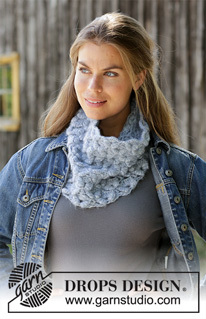 Crochet a band of chains, 2 ch for each puff. In the video we ch 14 for seven puffs. Turn and in 2nd ch from hook work like this: yo, pick up yarn, yo, pick up yarn in same st, yo, pick up yarn again in same st, now 7 loops on hook. yo and pull through all 7 loops, yo, pull through st = 1 puff. Skip a ch and make a puff in next ch. Following rows: keep making puffs the same way in the stitch above each puff from previous row. OUAH ! chouette … Jamais eu d'explications aussi claires ! Je n'ai jamais osé entreprendre quelque chose au crochet par manque de clarté. Merci , je m'y mets tout de suite . Merci pour ces explications qui sont très claires ! Bellissimo il punto e chiarissima la spiegazione. Este punto es precioso,sencillo de hacer y rápido.